Making predictions is difficult – especially about the future. But that’s just what fruit producers wrestle with every day. In order to help growers make timely and economically sensible decisions, WSU scientists have parsed a mountain of data on weather and pests. The result? The WSU AgWeatherNet and Decision Aid System – two tools to help orchardists bank against the future. AgWeatherNet (AWN) provides access to raw weather data from the Washington State University weather network, along with decision aids. AWN includes over 160 weather stations located mostly in the irrigated regions of eastern Washington State but the network has undergone significant expansion in Western Washington and in dry land regions of the state. The AWN network is administered and managed by the AgWeatherNet team located at the WSU Irrigated Agriculture Research and Extension Center in Prosser, Wash.
Video-Interview with Gerrit Hoogenboom, AgWeatherNet Director. The AWN network is administered and managed by the AgWeatherNet team located at the WSU Irrigated Agriculture Research and Extension Center in Prosser, WA. However, AgWeatherNet is programmatically linked to the research, extension and instruction efforts conducted by all departments and research and extension centers of the College of Agriculture, Human, and Natural Resource Sciences of WSU. AgWeatherNet data may be accessed and retrieved free of charge. Although membership is not a requirement, access to data for Guest Users is limited to the publicly available tools on the web page. Registered Users who login have the privilege of accessing the entire AWN data set through the web based tools that are provided upon login. Registration information is confidential and used by AWN staff for statistical reports and to provide better services. Therefore, we encourage all users to register for an AgWeatherNet account and login. Please feel free to contact us if you have any questions about the operation of AgWeatherNet and the decision aid tools or if you are interested in supporting a new weather station. AgWeatherNet (AWN) provides access to current and historical weather data from Washington State University’s automated weather station network along with a range of models and decision aids. The weather data, advisories, weather data products and decision support systems provided by AgWeatherNet and WSU can help improve production and product quality, optimize resource use and reduce environmental impact. 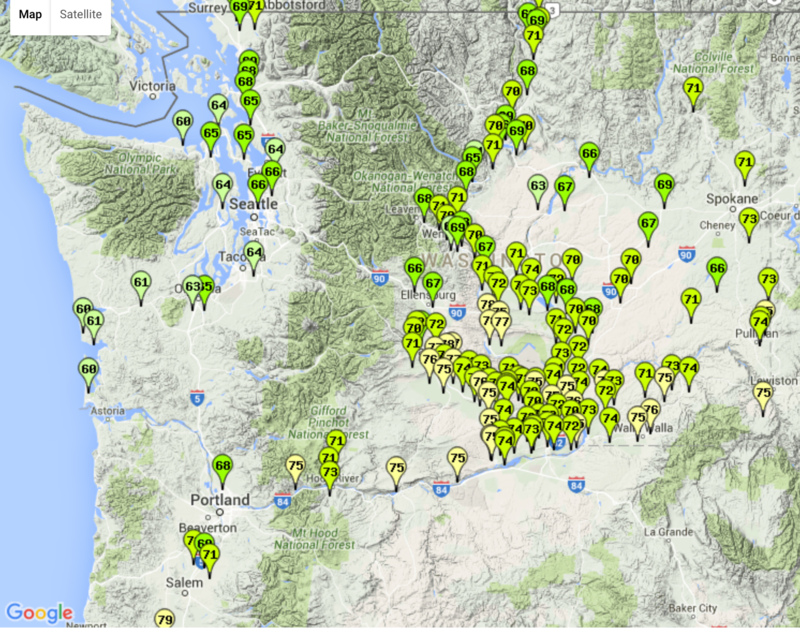 AWN includes over 168 automated weather stations located mostly in the irrigated regions of eastern Washington state. Since the installation of the first station in 1988, the network has undergone significant expansion in western Washington as well as in the dry land regions of the state. Standard AWN weather variables include air temperature, relative humidity, dew point temperature, soil temperature at 8 inches, rainfall, wind speed, wind direction, solar radiation and leaf wetness. Some stations also measure atmospheric pressure. These variables are recorded every 5 seconds and summarized every 15 minutes by a data logger. Locations of AWN stations as viewed using the interactive Google Maps app on their website (as of 10/2015).